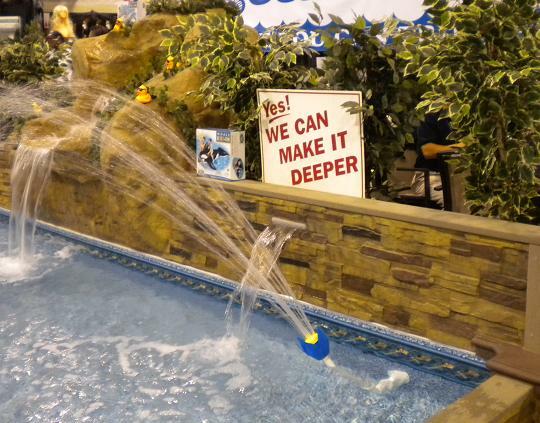 An unusual, but vivid, accommodation is offered at the L.A. County Fair. The valley holds surprises everywhere you look. 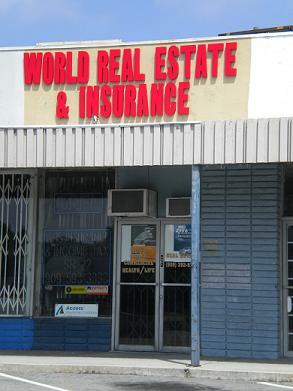 For instance, this narrow storefront would seem to be the nerve center for two mighty industries. Seen on North Garey Avenue in Pomona. There’s no place to buy compact discs at Victoria Gardens (although there’s a Best Buy across the street, if that counts). 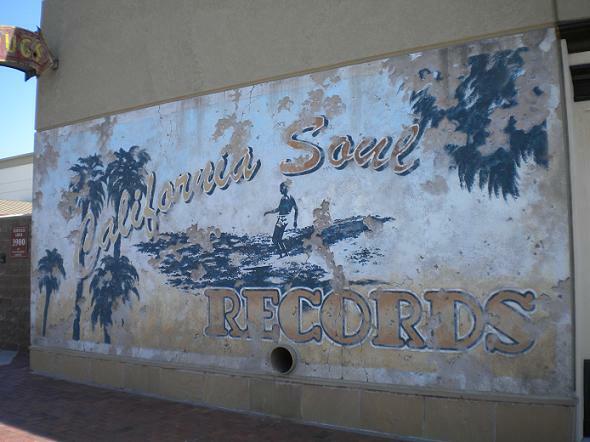 The closest thing to a record shop is this painted ad, artistically aged, for the nonexistent California Soul Records, which adorns a wall near the VG’s sheriff’s station a few yards north of Johnny Rockets. This is one of many old signs at the open-air mall that add visual interest and mimic the idea of this being a real downtown with remnants of past businesses still visible. (A portion of another one, reading “Rugs,” is at top left.) I doubt if most people get the joke, but I like it. I also wish there were a California Soul Records for me to shop at. 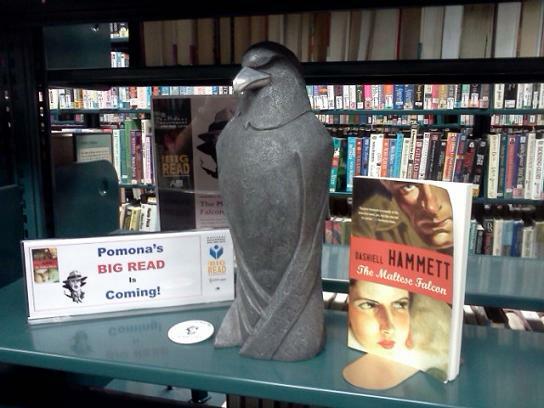 Pomona has a ton of events planned for its Big Read community reading program centered on Dashiell Hammett’s “The Maltese Falcon.” Find the calendar of events here. To single out four of the best: the Oct. 8 kickoff with Hammett’s granddaughter and several mystery writers; the Oct. 22 chance to have your police-style mug shot taken in a fedora or feathered hat; the Oct. 29 appearance by Denise Hamilton, Patt Morrison, Hector Tobar and Gary Phillips; and the Nov. 13 screening of “The Maltese Falcon” at the Fox. But there’s plenty more, including book discussions, crafts events for kids (make your own falcon! ), an appearance by the Police Department’s bloodhound, a classic noir film series and other chances to see the movie. Meanwhile, Claremont has events surrounding its own reading program, based around “Into the Beautiful North” by Luis Alberto Urrea. You can find a list of those events here. Part of the Colonies shopping center off the 210 Freeway, The Heights is in a building along Campus and has established a good reputation for its food and bar. I’d been meaning to check it out, especially after it captured “Best Restaurant Bar” honors in the Bulletin’s Readers Choice Awards. Recently I met a friend there for lunch. 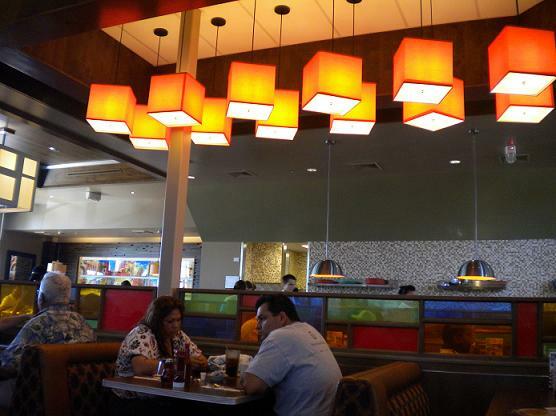 The interior is casually nice, with comfortable booths, tile floor, gold and deep brown colors and a classy feel. Good place for a business lunch or to impress someone. The dining room is separated from the bar seating, but that area looked inviting too. 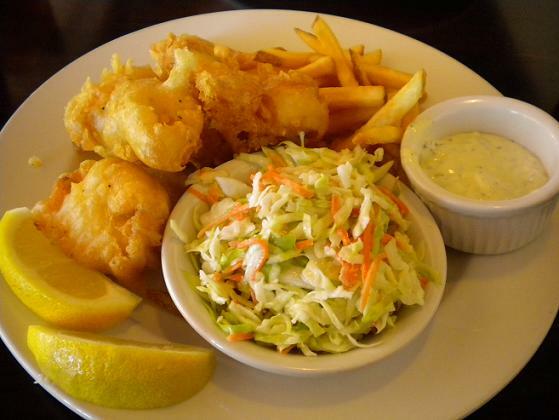 I had the fish and chips (price forgotten, sorry), hand-battered halibut with fries and slaw on the side. It’s one of their signature items and proved to be among the best fish and chips I’ve had. The fries were good, the slaw was meh. 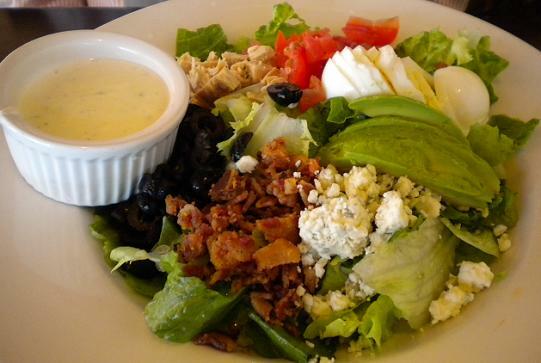 My friend had the Cobb salad and said he liked it. Service was attentive and we got plenty of refills. The dining room, almost empty at 11:45, was almost full by 1 p.m. Clearly the Heights is doing something right. 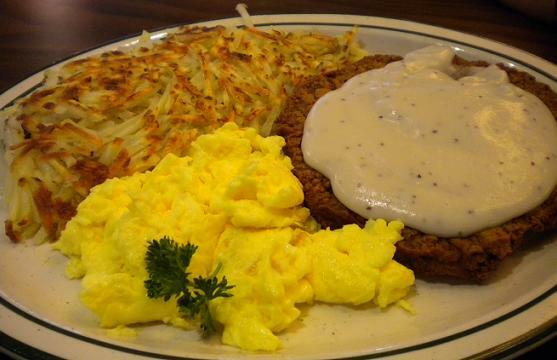 They have burgers, sandwiches, salads, pizzas, lasagna, pork chops and chicken marsala, among other items. 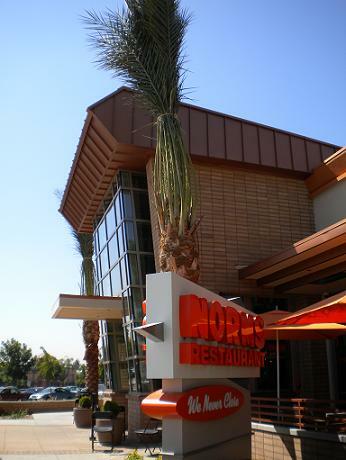 Can you believe it’s owned by the same family that has the Village Grille diner in the Claremont Village? 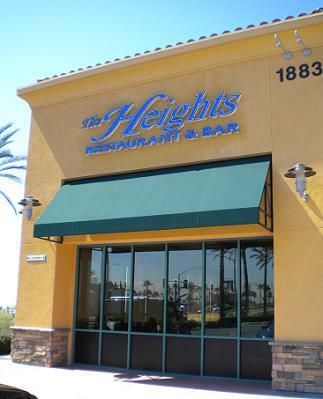 “Fine dining” is a stretch, but The Heights probably is the nicest restaurant in north Upland. After his Aug. 22 death, obituaries for songwriter Jerry Lieber (“Poison Ivy,” “Hound Dog,” “Stand By Me,” “On Broadway,” dozens more) noted that his fascination with rhythm and blues music began when he heard L.A. disc jockey Hunter Hancock. 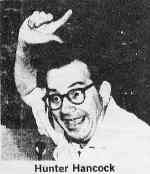 Hancock, described as the West Coast’s Alan Freed for his influence at bringing black music to white teens, lived in L.A., but he closed out his life at Claremont Manor, where he died in 2004. A revered music figure, he was revered at Claremont Manor too, where his photographs still adorn the walls and where his irrepressible good spirits enlivened the halls. Almost sounds like a rhythm and blues song. I met Hancock in late 2002 at Claremont Manor and published this feature story about him in the Daily Bulletin on Jan. 16, 2003. The full text is below. 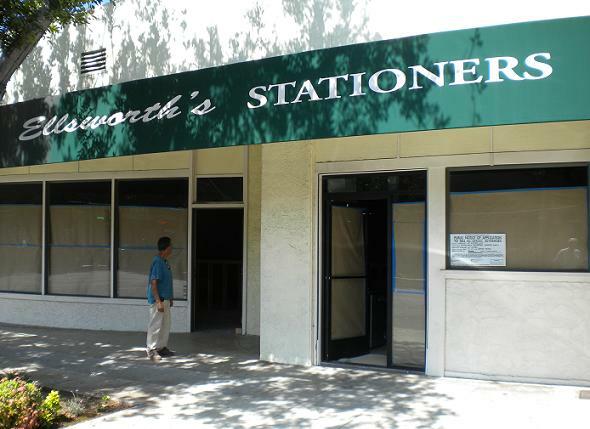 The former Ellsworth’s Stationers at 2317 D St. in downtown La Verne is being replaced later this year by House of Wings. Ontario had a food truck festival in June that was a major deal, with a repeat scheduled for Oct. 8. Chino beat Ontario to the punch, however, with a smaller festival in April to benefit the Chino Valley Unified School District. A second one took place Saturday, again at Don Lugo High. Fourteen trucks were represented at the Foodie Truck Festival, as it’s dubbed. Very nice event, with short, manageable lines and a good range of trucks selling Korean, Mexican, Italian, Filipino, Japanese, American and other foods. 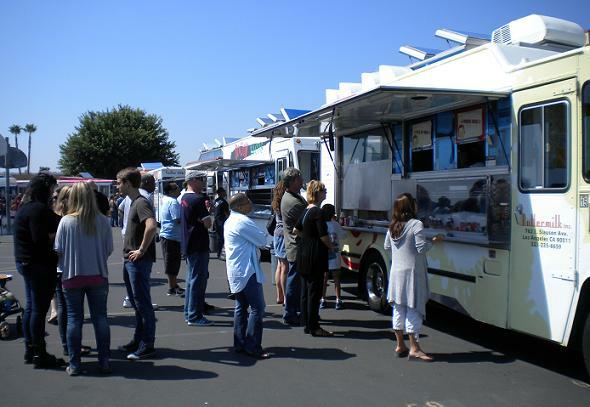 LudoBites, Rebel Bites, Bool, Don Chow, Buttermilk, SliceTruck and Pie ‘n’ Burger were among the trucks. 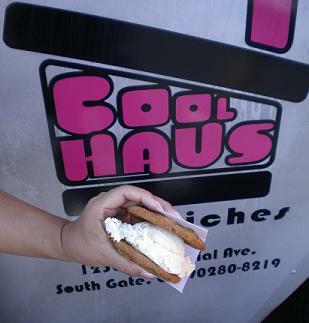 Coolhaus, which sells gourmet ice cream sandwiches, had 20-minute waits at its peak, the longest of the day. I was in line twice as long for the same truck in Ontario. The peanut butter ice cream inside chocolate chip cookies hit the spot on a hot afternoon. 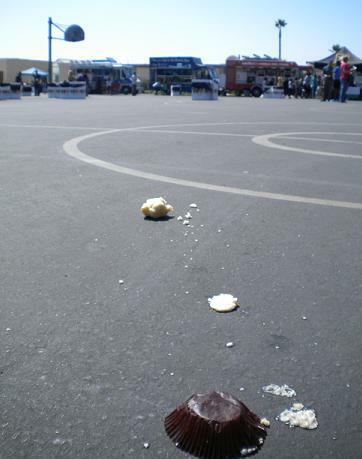 Below, the saddest sight of the festival: Someone’s spilled cupcake from My Delight. 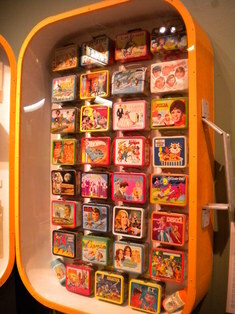 This is half of the lunch-box display in the Sheets Center for the Arts at the L.A. County Fair, described in my Sunday column. The photo is a thumbnail; click on the image for a much larger view so you can eyeball the boxes in loving detail. Perhaps the most curious of the bunch is the one with the Kellogg’s Frosted Flakes logo and Tony the Tiger. Is this a lunch box or a breakfast box? More lunch boxes, including the Beatles and “Gentle Ben,” are in the other half of the faux lunch box case. You’ll have to go to the Fair yourself to see those.